A big-name player in the ownership of retail centers may soon be getting bigger. On February 5, 2007, Simon Property Group Inc., which holds interest in some 286 retail properties, mostly enclosed malls, offered to buy beleagured rival Mills Corp. for $24 per share. This isn’t the first offer Mills has received recently. Just three weeks ago, Mills received and reportedly agreed to be acquired by Canadian-based Brookfield Asset Management for $21 per share. This deal is still in place; however, a joint press release from both Mills and Simon have indicated this sweetened deal will clear the negotiating table for a possible deal. There was no comment from Brookfield Asset Management, who could also respond with an even better bid than Simon. According to the president of a Chicago-based retail consulting firm, the Simon offer is much more attractive to many of the properties owned by Mills, because Simon has leverage to attract better tenants, a history of experience in managing retail venues, and immense financial resources for making much-needed improvements or additions to existing centers. These offers come on the heel of a sour period for Mills, as they have recently tried to unload many of their properties such as Southridge Mall in the Milwaukee area. Up until a few years ago, Mills was a hot commodity, opening their unique brand of off-price, large enclosed malls every few months, many of which are located in large metropolitan areas. 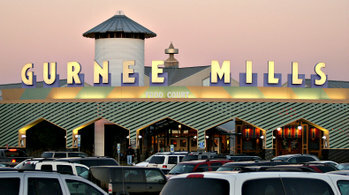 Mills began in 1985 as Western Development Company and later changed its name after debuting its first off-price mall, Potomac Mills, in the Washington, DC area. What do you think about the possible merger? Will it make the Mills properties better overall with Simon’s leveraging power, or will Simon attempt to change them drastically? I think Simon will probably do fine with purchasing Mills, personally. They seem to do mostly well with running malls they own. Two words: Cincinnati Mills. (P.S. I highly recommend you pay it a visit soon before it dies any further) This is I think the worst-performing “Mills-branded” property in their portfolio- a shame, because it’s by far their nicest in terms of design (mostly because it’s the former Forest Fair Mall.) Simon is going to have a dickens of a time managing these. Makes sense, I suppose. I hope they resurrect the seemingly-dead Tewksbury Mills project in Massachusetts! Yeah, I personally hate how Westfield technically CHANGED THE NAME of every mall it owns, along with a standard sign and decor in each one. It totally wrecks the individual character of each place, and with suburban shopping malls there really isn’t too much character to begin with. Simon brands more than most people notice, I think (like the printed directories, some indoor signage, the info kiosk, etc.) but it’s not as obtrusive. Let’s hope Simon doesn’t start doing that once they acquire Mills. SImon owns my hometown (Fond Du Lac) Forest Mall, which it has since it opened on September 11, 1973. I’ve followed the mall’s ups and downs literally since I was born, being from the area. Now I probably shouldn’t base their managment tactics based just on my little 450,000 sq ft hometown mall….it just wouldn’t be fair of me. Due to my town’s small population, the mall isn’t as fast about filling in vacancies as other malls are, with national tenants. Often times, they’ll temporarily lease vacancies to ‘mom-n-pop’ stores, but there is still a strong roster of tenants, backed up by a popular Kohl’s, Younkers, Sears and Penneys for anchors that draw traffic. Forest Mall is especially busy during the holiday period, as we draw from Beaver Dam, West Bend, Sheboygan, as well as Calumet, Green Lake, and Winnebago Counties. Simon also owns the Bay Park Mall in Green Bay, which was originally a DeBartolo mall, acquired by Simon when DeBartolo and Simon merged their portfolios together back in the mid 1990s. This mall is a magnet for the surrounding Green Bay area. Not ‘everyone’ likes going down to Appleton (even if its only a 20 minute drive away) to their hectic Fox River Mall. If they take MIlls, Simon will again have 3 malls, taking over Southridge in Milwaukee. I believe they will handle the mall well enough, knowing what they’re up against. Southridge will need to remodel completely…it still has shades of its 1980s remodel and the skylights and ceiling layouts are still vintage 1970 when the mall opened under Taubman/Kohl family ownership. All Mills Corp did (and could do, due to their financial struggles) under their short watch of Southridge, was to add a kids’ play area, and remove all the fountains……a bad move IMHO….that was the LAST mall in Wisconsin that still boasted fountains up until Mills took it over in late 2004. Overall, Simon I feel will handle this…should it go through, in stride. They’ve got the cash to do what they must with these properties. The Mills ‘outlet mega malls’ will need tweaking….possibly outlet/traditional mixes, possible teardowns of more vacant areas of the malls to create ‘lifestyle’ components (as much as they’re loathed by us mall nuts). We shall see what happens of this Keep tabs on it you guys. I think this is going to be good for Simon to take over The Mills Corp. The Mills owns Esplanade Mall in Kenner(suburban New Orleans) LA, which was briefly owned by General Growth Properties. This mall reopened in October, just a couple of months right after hurricane Katrina with only one anchor, Dillards. The three story Macy’s did not re open right away because according to articles in local papers, officials with the legendary dept store said that they needed to re evaluate the New Orleans market, as well as the acquisitions of the 4 Foley’s stores in south louisiana, including 2 just 55 miles away in Baton Rouge. So they pushed back the reopening from the fall of 2006 to fall of 2007. Officials stated that there was wind and some water damage to this store and that a complete remodeling/renovation will be needed. Which it probably needed anyway, because this is the first Macy’s opened in Louisiana and has very little renovation since the mall and the store opened in 1984. The Macy’s label is still on the builiding, but there is no merchadise in the store, only empty shelves and racks. But the other Macy’s in downtown in New Orleans, in the former Simon owned property called New Orleans Centre mall will not reopen. The New Orleans Centre, next to the Superdome, was dying before the storm, which finally killed it. I believe Simon will solidify the return of the Macy’s to Kenner. As well as fill the other empty space left by the closed Mervyn’s, which was still opened the night the storm hit, but was on the list of closures for the dept store before the storm. The other 5 Mervyns in louisiana, 2 of those also in the NO area, all closed after the beginning of 2006. Simon would be better at getting another midline department store such as Kohls or JCPenney to this space, or a Target, which has already been rumored to take up the empty space. I was there a few weeks ago and this mall appears to need a boost. It has lost just a few in line retailers, the biggest being Banana Republic. It definitely needs Macy’s back, as well as the other anchor spot filled. This mall is just a few miles from many upscale neighborhoods, and this part of metro New Orleans is almost completely repopulated since the storm hit. Simon has the experience in managing this kind of mall and will know exactly how to bring it back to its grander days. It is still a nice property in a good part of town, it just needs a little shot in the arm to see it prosper again. Let’s see now. BAM owns very few retail properties and Simon owns at least 286. BAM just doesn’t have the retail experience that Simon does. In 10 years, would these malls be extinct from BAM’s lack of experience? I don’t want to see that especially since Mills tore down Opryland in Nashville to make way for Opry Mills. Simon better buy out Mills. It’s the better choice by far! Who the heck is BAM? If I’m not mistaken, Simon also owns the Chelsea Premium Outlets, which is similar to the Prime Outlets centers across the United States. Many of the tenants in those outdoor outlet centers are similar to what is found in the Mills malls. I am expecting Simon to go through with this acquisition since it is among the most experienced REITs in the industry, not to mention the fact that it can put some great ideas to good use like it has done before with its own malls. Simon does indeed own the Chelsea outlets. Sorry. Should’ve used Brookfield Asset Management first and then initials. My mistake. While catching up on the day’s news, I came across this. It’s looking like Mills’ and those invested in the company are liking Simon’s bid for their portfolio, and are going to bite unless Brookfield Asset Management has something better to offer. It’s over! All Mills websites redirect to a Simon subpage in the same generic format! Darn! Macy’s is going to reopen it’s store at Simon’s newly acquired Esplanade Mall in Kenner. Something this suffering property has been without since August 29, 2005 when hurricane Katrina devasted the New Orleans area. The Mervyns never reopened but was part of the chain’s 2006 closing of all Louisiana stores, and so far nothing has been announced about what will be done with the empty anchor. Also this announcement revealed the store will be a 2 level store featuring there new store format, instead of the the old 3 level format that has been there since opening in 1986, construction is already underway on the forthcoming remodeled store. With this good news came the announcement that new stores and some much needed updates will be coming to the mall, this is already happening. According to the mall’s website, Esplanade will be getting a BCBGMAXAZRIA. Simon is the saving grace Esplanade has needed since the storm accelerated the already slumping, aging property with the literal overnight loss of 2 anchors. As well as The Mills Corp never came through on the promise of a 4th and possibly 5th anchor store and generally ignoring this mall and letting it fall to the waste side while concentrating on new Mills outlet type centers. Also announced is that Macy’s will be building a new 228,000 square foot store at Lakeside Shopping Center in Metairie and confirmed the closing of the New Orleans Centre store in downtown next to the Superdome. I will post more about the new Macy’s under the topic of Hello Macy’s! and provide some links from nola.com about the plans for the new stores, which are both scheduled to open in November 2008.